Home Remedies for Ingrown Hair At Home That You Must Know! Are you planning to get rid of those unwanted hair from your body? You might be planning to buy the razor kit and most of you may have even bought it. Few may have even observed a peculiar outgrowth on your skin which is painful, sore or warm to touch. This condition of ingrown hair arises when the hair grows sideways or curls back in the skin itself. It is prevalent amidst people having bristly or curly hair and also occurs due to shaving or waxing frequently. 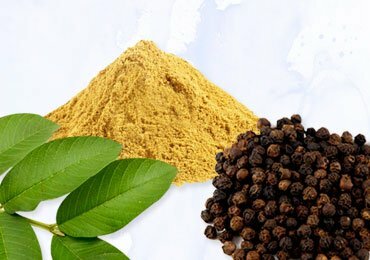 Hence, we bring here some effective home remedies for ingrown hair. It is not necessary that it may cause an infection of the hair follicle which is also known by many names as folliculitis, the famous “razor bumps”, or the pseudofolliculitis barbae. It varies in size. They appear mostly in the arms, legs, beard area or bikini area. Of course, they disappear with time but what if we say that there are various remedies to get rid of this gut-wrenching feeling without visiting a doctor? Know some of the easy home remedies for ingrown hair quickly. It may seem weird but the potato is one of the most effective home remedies for ingrown hair. 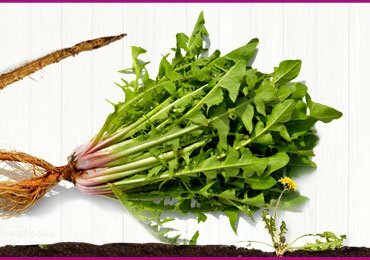 It is also one of the easily available vegetables in the market and thus this remedy is highly preferred by people worldwide. 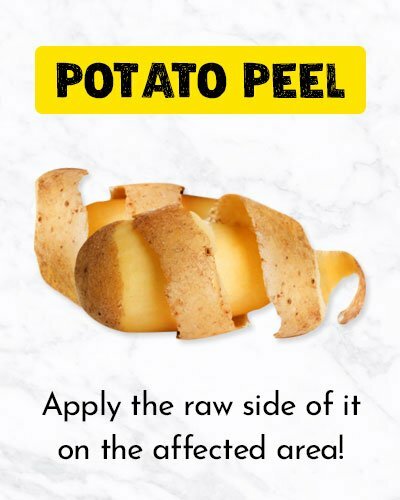 All you got to do is peel the potato and apply the raw side of it on the affected area for 24 hours. It is advised to use a band-aid so that the peel does not move. 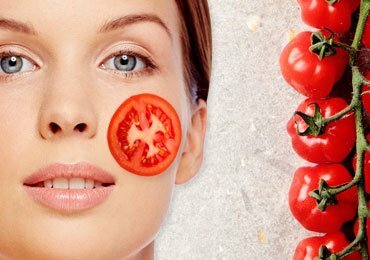 Potatoes lessen the puffiness, boost skin rejuvenation, nourish and moisturise the skin. Moreover, it has a huge level of starch which precisely pulls out ingrown hair. The outcome of the remedy is astounding. So, next time, think twice before throwing the peels away. Aloe Vera has always been a potent herb and is well known for it’s refreshing and soothing benefits. Aloe vera has always been a very beneficial herbal cure to stop the ingrown hair. All you got to do is apply it on the affected area and leave it for half an hour and then rinse it off with lukewarm water. This process is to be repeated two times daily and for seven days, consequently reducing the razor bumps and the ingrown hair. 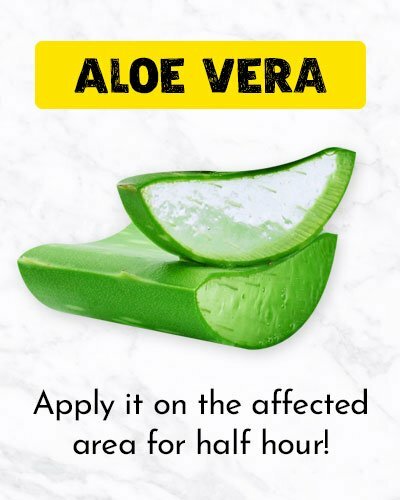 Applying aloe vera on the infected area instantly assuages it providing immediate relief from redness, inflammation, and itching. Moreover, the healing process is fastened by it. 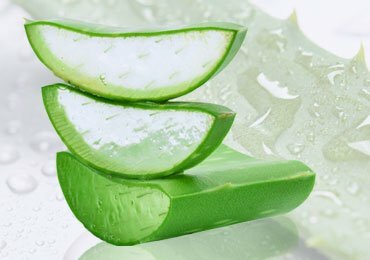 Aloe vera, unlike other astringents, does not contain alcohol because of which it is used after shaving in order to prevent the burning sensation. This home remedy is the easiest one. 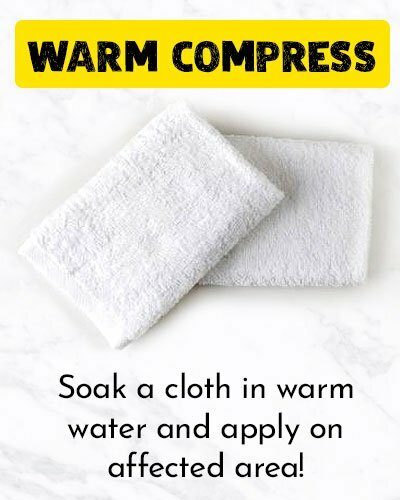 Soak and squeeze a cloth in the warm water and apply it on the infected area. Continue to follow the process several times a day, till you notice the hair come out of the skin. 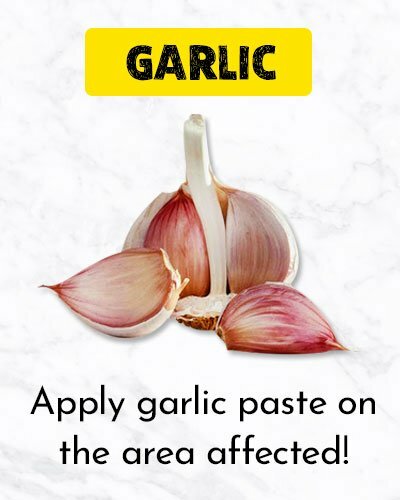 From seasoning food to ingrown hair, garlic has many uses. All you got to do is crush the garlic and apply the paste on the area affected and use a bandage on the area. Wait for 30-45 minutes and rinse it off with water and mild soap. Follow the process twice a day. Coffee, when mixed with lukewarm water, can work wonders to fight the problem of ingrown hair. 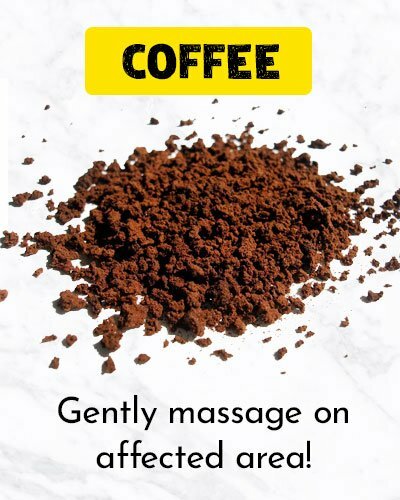 Mix coffee and lukewarm water and make a paste. Now apply the paste to the infected area and gently massage it. Wait for 15 minutes and rinse it off with warm water. Take a cotton ball and dip it in castor oil and use a thick layer of it on the affected area of ingrown hair. Wait for 15 minutes and then clean it off with a wet cloth. For the best results, repeat the process 2 to 3 times on daily basis. 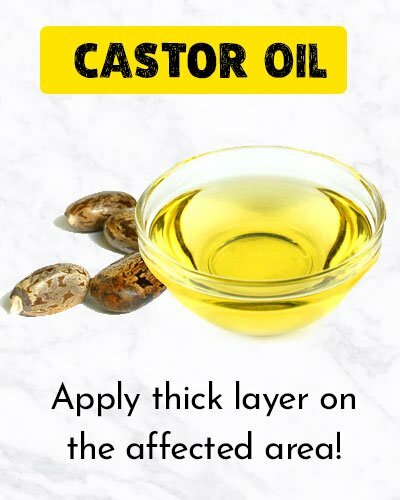 This thick mask of castor oil unblocks the pores thus releasing the pus and the ingrown hair. Beauty treatment is considered incomplete without exfoliation. Milk and Bread is one of the best exfoliators which makes the ingrown hair loose and makes the loop come on the surface. 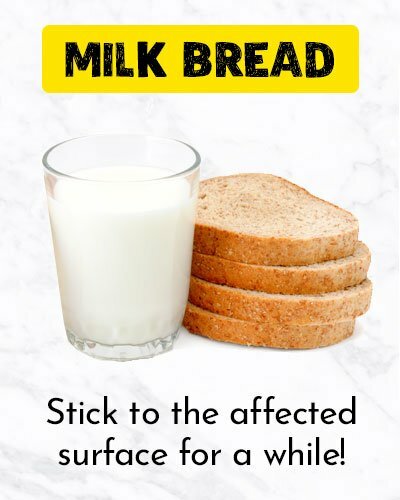 Take a chunk of bread and simply dip it in lukewarm milk. Subsequently, apply it to the infected area and use a bandage over the area in order to help it stick to the surface for a while. Continue the process till the hair loop is visible on the surface of the skin. Now use a sterilized needle to pull it off. 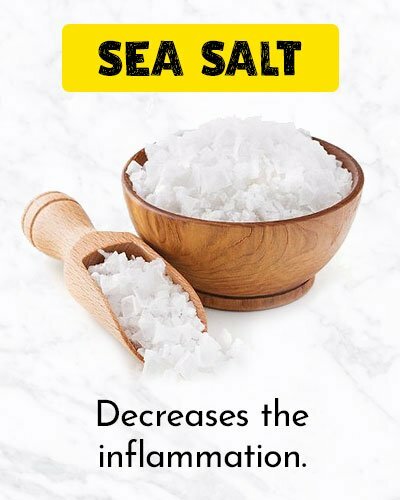 Sea salt has many amazing benefits that many people are unaware of. From enhancing the circulation of blood to decreasing the inflammation to fasten the process of healing and to the exfoliation of the skin, sea salt has it all. All you need to do is mix sea salt with water and make a paste. Apply it to the affected area using a cotton ball. After 10-15 minutes rinse it off with lukewarm water. For the best results repeat it twice a day. Epsom salt also helps in softening the ingrown hair and thus helps in bringing it to the skin’s surface. All you are required to do is to put some Epsom salt in the water and soak your body in it. 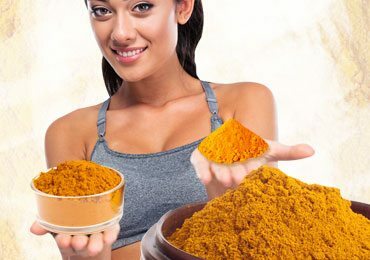 WARNING: If your body is salt-sensitive, then please DO NOT try this remedy. Sugar is a very famous natural exfoliator which removes the dead cells of the skin and also removes the ingrown hair. Make a sugar scrub by mixing one cup of white sugar with half a cup of pure and natural olive oil. Also, add ten drops each of lavender and tea tree oil. 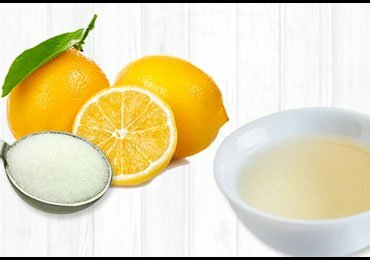 Apply this homemade sugar scrub on the affected area and gently massage it for few minutes. Wait for five minutes and then rinse it off with lukewarm water. 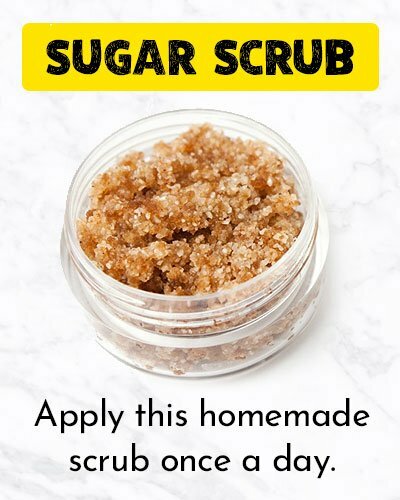 Apply this homemade scrub once a day. TIP: You can store the scrub in an airtight container for future use. 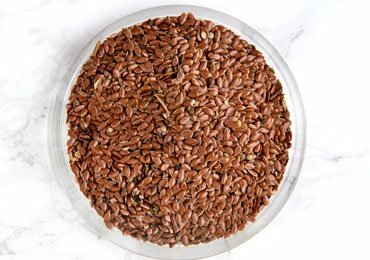 This beneficial ingredient has hydrating and anti-inflammatory properties. 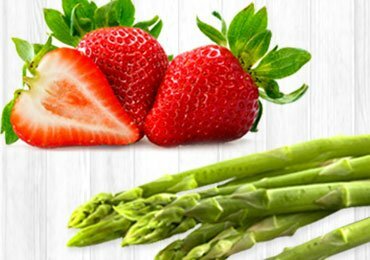 It also contains vitamin C that reduces the pain and itchiness. Keep the cucumber in the refrigerator for 30 minutes and make thin slices of the cucumber. 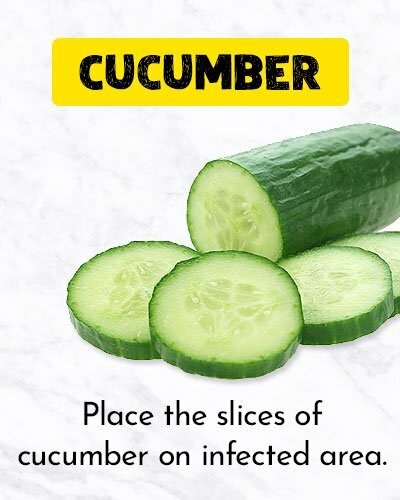 Now place the slices of cucumber on the infected area. This manageable remedy is to be continued till the traits of ingrown hair abate for good. There is another alternative in which the cucumber puree is mixed with milk. Refrigerate the mixture for 30 minutes and then apply it to the infected area with a cotton ball. Wait for 15 minutes and then rinse it off with the help of lukewarm water. 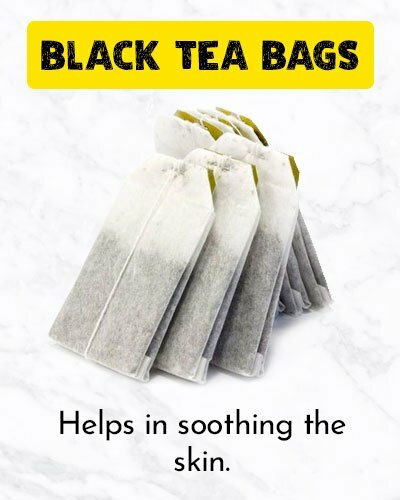 Black tea bags also help us get rid of the ingrown hair. Black tea comprises of tannic acid, which helps in reduction of redness and puffiness and also helps in soothing the skin. Moisten the tea bag with water. Rub it over the infected area for 3-4 minutes. Try this remedy twice a day in order to get the best results. Soaking the tea bag in a warm cup of water is another alternative for alleviating the troubled skin. All you got to do is add coconut water to the strained mixture and then apply it to the affected area with the help of a cotton swab. For the best results apply it for at least a week. 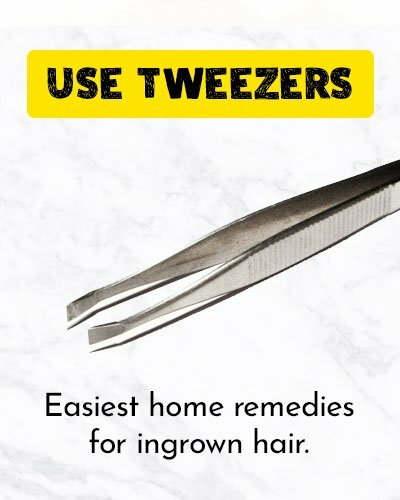 Using tweezers is one of the easiest home remedies for ingrown hair. But you must sterilise your tweezers before using it in order to provide further infection. After sterilising the tweezers you must do the warm compress on the ingrown hair lying close to the skin. After the affected area becomes soft you can gently pull the hair above. Moreover, a sterilised needle can also be used to pull the hair loop above the skin. Avoid tweaking the hair as it can be painful. Baking soda is considered as one of the best home remedies for ingrown hair because of its soothing effects and anti-inflammatory qualities. Baking soda is also a natural exfoliator and thus helps diminish the redness and itching on the infected area. 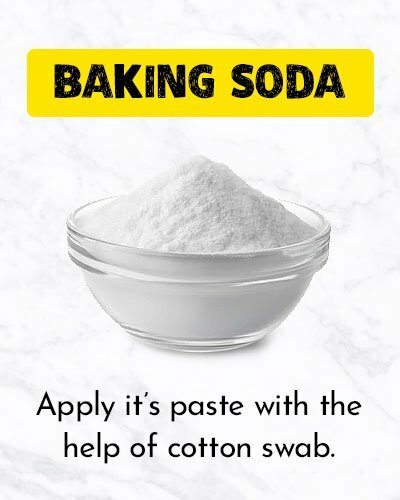 Mix the baking soda with water properly and apply the paste with the help of cotton swab over the infected area. Wait for 5-10 minutes and then rinse it off with the help of lukewarm water. For effective results apply it daily for at least a week. You can also create a homemade scrub by mixing baking soda, ground oatmeal, and water. 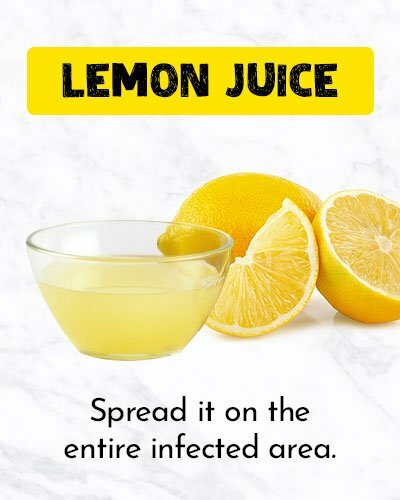 Apply and spread the lemon juice on the entire infected area and wait for the juice to dry. Once it dries, wash it off with the help of lukewarm water. 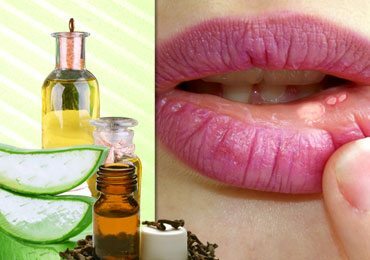 WARNING: If you have a sensitive skin, then please DO NOT try this remedy. It may cause skin reaction in few people. 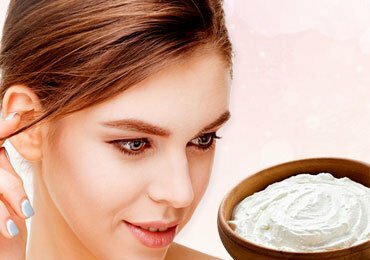 Apart from being a good moisturizer for the skin, honey is also blessed with anti-bacterial properties which prevent further infection of the affected area. Honey is also a good antiseptic which reduces the inflammation. 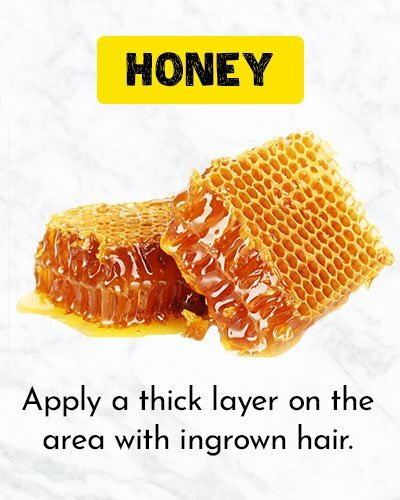 Apply a thick layer of honey to the area with ingrown hair. Allow it to dry for 10 minutes and wash it off with the help of cold water. TIP: Instead of going for the processed honey, it is recommended to go in for raw unprocessed honey. Always apply some antiseptic ointment after removing the ingrown hair. Instead of shaving, women should always go for waxing. The affected area should always be washed using mild soap with lukewarm water. Before shaving, the skin should always be exfoliated. Before trying any of the home remedies for ingrown hair, make sure that your skin is moisturized. Try wearing loose clothes on the areas having the ingrown hair. After the removal of ingrown hair, do not shave for at least 4 weeks. Use new razors and blades for shaving. 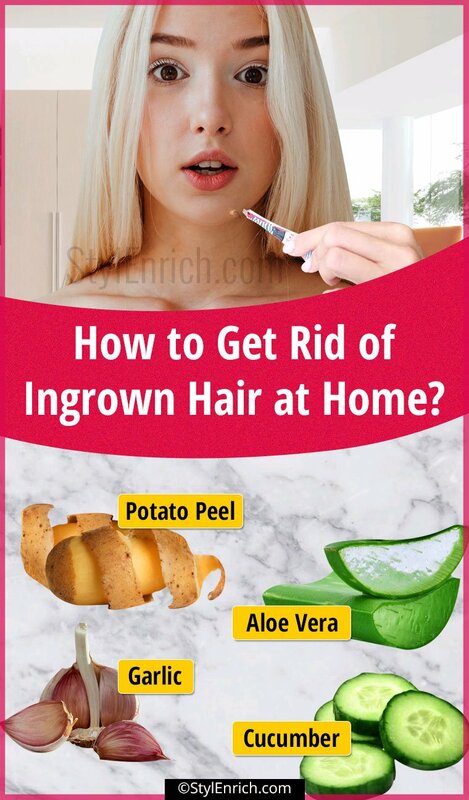 So, now you know the home remedies for the ingrown hair you can easily do within the four walls of your house instead of going to the parlors or seeking medical help for the ingrown hair. If we have missed on something, feel free to share your views in the comment box below, also share your stories of ingrown hair with us.